We’ve already told you about best free website builders and this time we will tell you about best family tree builders. Family Tree building software help in researching family history, building a tree for your own family, adding photos, date of birth related information, important events and historical records . Almost all such software is hosted on the internet and support a lot of useful functionality including the ability to match your family tree to information about relatives from millions of other family trees. Most of such family tree builder software also includes extensive charting capability and advanced record matching technology which can help you connect to the historical records pertaining to your ancestors. These programs also provide excellent private site functionality which gives you the ability to update your family history, data and events in a secure way on your personal site. Providing privacy settings at a granular level, these sites enable you to update and use sensitive family data in a safe manner. These sites also provide very easy to use import functionality which can help. These family tree builders can be particularly a great aid for those looking for information related to family lineage. Genealogy software reviews enable you to choose the right one so that you can seek information related to where their ancestors came from and their lineage. How to create a family tree – Online or Offline? The first step in creating a family tree is to do the due research into your ancestry in order to find out who should be included. You then create a diagram for each generation in order to create the first version of your family tree. There are two types of genealogy software providers – Online and offline. Offline family tree software, also known as desktop family tree software, operates on the device of your choice but does not require an Internet connection. You are able to save all your personal information offline and organize it the way you want, either on your own computer or any device. This means unless you decide to export part of or the entirety of your data from the program or share your data file with a different user, nobody else can gain access to your details. You can share data selectively, meaning you get to choose the families or individuals to export. Thus, your data remains confidential, especially that involving living people. Many offline software programs enable you to choose a section of the existing database, and save it as a different file. The best part is no operation involves online sharing of information. Most of the available desktop family tree software are download-only. This means that you get limited amount of guidance, and usually have to resort to external online source. This desktop genealogy program helps create interesting reports and charts that enable you to visualize your entire family tree. You can share what you’ve discovered through your research efforts with others. This software has various tools that assist with researching, organizing, and charting your family tree. The program has an in-built browser to help to assist you in research more about your family online directly using the software. This means when you get new details, you are able to import the information directly to your genealogy tree maker. Once you collect all the information and family records, you’re able to choose the type of chart you wish to display your information on out of 25 separate chart designs and 20 different reports. You can use Legacy for the offline export and import GEDCOM files quickly. You are able to sync family trees to the Internet, and create whole web pages for displaying the family history. You can choose between HTML-based or Java-based pages. However, you can create both easily using a couple of clicks. The software interface is clean and easy-to-use. You have no trouble finding suitable tools, and the toolbar and ribbon menu can be customized for quick access to the most-used features. Multiple types of marriages are on display along with more complex details. Media and notes can be added regarding individuals. You can easily check for time gaps, duplicate entries, and other significant problems. There are several tools for recording the significant milestones in your ancestor’s life based on records. You get a lot of information from reports like the origins report. This indicates the percentage of blood present from every country of your origin. Information can be collected from relatives through interview notes, questionnaires, and research logs. These also help track your progress. The formats and fonts can be customized, and you can maintain records of where and how you got your sources. Legacy family tree software is extremely simple in terms of operation, and even if you have any doubts, they are easily answered in the FAQ section. Extra resources are available online. Simple video tutorials are also present, providing step-by-step instructions on using the program. Family Historian is a family tree builder that assists you in your family tree building activities thanks to excellent accuracy scores, simple data entry methods, web-assisted features, and paperless charting. It might lack some features, like charting, but this software shines in terms of its accuracy and ease-of-use. This software features an in-app browser and a web search windows that enables you to search through genealogy websites via the software. Since the browser is focused in the program itself, all your work remains centralized and focused. Online research leads are no longer difficult to find thanks to a handy web hint tool. Family Historian supports GEDCOM files and allows you to import family connections and individual details without the risk of errors. Adding new relationships is a breeze thanks to this software. A world map shows any location linked to people and events. The software shines in the field of paperless charting. Sources can be easily added to Family Historian, and you are able to view every one of your linked media and individuals in a single window. You will not face any trouble figuring out how to operate Family Historian. In case of any questions on family history research, you are free to consult online resources or printed materials. Aside from email support, the FAQs section helps you understand the different functions and tabs within the program. 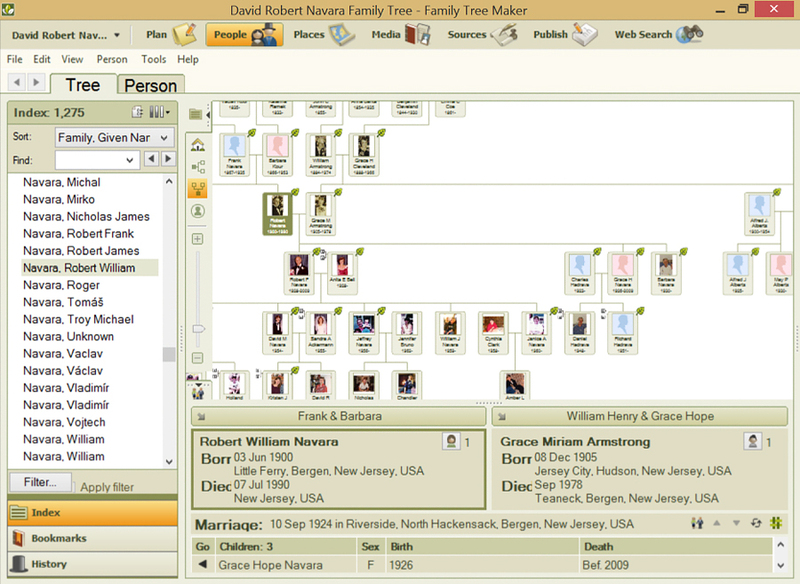 Online software forms the backbone of the current online genealogy trend. They provide the necessary support when you are interested in producing and publishing your own genealogy website, complete with any first-hand evidence about your family. Online software allows you to upload evidence gathered through different websites/blogs belonging to someone else, or any of the excellent ancestry websites scattered throughout the Internet. You can also use online genealogy software providers to correct and comment on your family tree anytime you are online. You need to maintain backup your files every time you sync your family tree. Also, you can never update both the offline and online family tree files at the same time, as it often leads to the loss of research from any one or both of them during the syncing process. Family Tree Maker software comes with a clean, simple interface jam-packed with features that allow you to locate and store numerous family members. The software generates web hints for people in your database whenever it finds similar or matching data around the web. You can access records, such as marriage and military documents, censes, old school and yearbook photos. You can import GEDCOM files into the program without any hassle. Text fields are auto-populated and no editing is required. This software allows you to enter details directly into your genealogy tree maker. Family tree lists are available in a pedigree format, so that it is easier to enter information and maintain a timeline of the generations. Each person’s data can be customized as required. Complex relationships like stepchildren and remarriages also find a place in this family tree software. This genealogy tree maker software lets you access a physical map showcasing the origins and migrations of your ancestors. The more detailed your pedigree charts are, the more places will be pinpointed on the map. The program notifies you if any information is wrongly entered. Same gender marriages can also be entered into this program. Adding source data, such as publishing info, author, and title, will allow Family Tree Maker to create a complete bibliography for you. Task lists can be created and your research organized as per individual, priority, and type. Family Tree Maker is supported via email and phone. Both printed and online user guides and articles can help you get accustomed to this software. The FAQ section is helpful if you wish to find some quick answers to common issues. OneGreatFamily is the perfect software for genealogists wanting to report their connections and link families together, with a little help from an active user community. Using this program, you can learn more about your family history in the United States and in other countries. This software aims to reconstruct the family tree of every single person in the world. The reason why this family tree software works differently from others and has a unique structure is because it serves as a cooperative research project. You not only benefit off this software’s users but can contribute your own discoveries as well. Family trees from around the world come together as one to form one big, interconnected family tree. Any new information has to pass muster. No conflicting information is allowed, nor is useless data. This fact-checking might be tedious but it actually provides a reliable research source. Any research you’ve gathered regarding your family needs to be entered so that the site validates this information. This software is great when you want verified information regarding your family and the connections you share with others. The tools section of this online genealogy tree maker software offers additional resources not present on the site database, like a surname index. When it comes to online genealogy search engines, it does not get better than MyHeritage software. This freeware family tree software allows you to go through countless documents, interact with other genealogists, and create your family tree. Its meticulous records and widespread network allow you to uncover your family history. There are thousands and thousands of searchable records in their database, covering every country, with some even dating back to the last millennium. The site is extremely easy to navigate and features a host of great tools like MyHeritage family tree builder, DNA testing, and a custom chart maker. Once you find a document connected to your ancestors, you’re able to view it and then download the original file. There’s a full-screen mode to give you a closer look at historical records. Searching for different family members through documents is easy with this program. The centralized dashboard on the MyHeritage family tree builder provides access to a wealth of information, including family trees, photos, charts, DNA testing, and contact details. Family hints are available, matching members of your family tree against its database. Your family tree comes to life with media and photos. The program allows you to print out customizable charts. This freeware family tree software is very easy to use but in case of any query, you can resort to telephone calls, emails, tutorials, and FAQs. It might not be easy to conduct research with this program though due to the lack of any kind of professional assistance. The only help you can get here are some community features, such as the message boards. However, the MyHeritage family tree builder is going to direct you towards a professional genealogy research service. The aforementioned offline and online programs are a genealogist’s best friend. With varying features and an expensive community, these tools help you build a comprehensive family tree.